Richard and James wanted to sell quality home-grown produce to local people. So In early 2003 a state of the art cutting plant was built at the farm to process James and Richards own pigs. The pigs are housed in large deep home-grown straw yards with plenty of natural light, air and space to exercise. Wheat and barley also grown at Priors Hall is harvested and made into pig feed in our own feed mill. ​The pigs only ever leave the farm once , that is when they to go to a local abattoir (only 7 miles)so trauma and stress from transport is minimal and the carcasses are returned here to the farm the next day so all our meat is extremely fresh. We believe we are unique in being able to go from grain to plate on the farm. 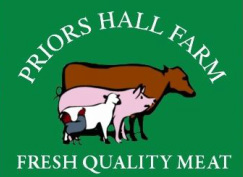 The high quality of our pork is due to the highest animal welfare standards adopted at Priors Hall, the fully traceable feed supply and of course the traditional recipes and methods we use on site for curing, smoking and preparing our hand-made products. Customers tell us our pork tastes like real pork used to!! Customers soon asked us about other meat products, therefore we spoke to other local farmers who rear their animals in a similar way to ours .We now supply high quality beef, lamb and chicken from other farms in Essex, Suffolk in line with our policies on quality, food miles, locally sourced produce and high welfare standards.All of which are available in the farm shop , or to order for delivery . We supply numerous, schools, pubs, farm shops, shops and restaurants as well as many farmers markets.